Housecats “tagged” to protect Tsushima leopard cat? Environmental advocates have come up with a set of guidelines aimed at preserving the Tsushima leopard cat (Tsushima yamaneko), an endangered and protected species that inhabits Tsushima in Nagasaki prefecture. Measures include mandatory registration of all domestic cats to reduce the number of strays and prevent the Tsushima leopard cat from contracting infectious diseases. The guidelines were decided at the International Workshop for the Preservation of the Tsushima Leopard Cat, which was held in Tsushima in January. Organizers are pressing the relevant national and prefectural organizations to adopt the proposed measures. The guidelines stipulate that cat owners must register their pets and have them implanted with microchips. 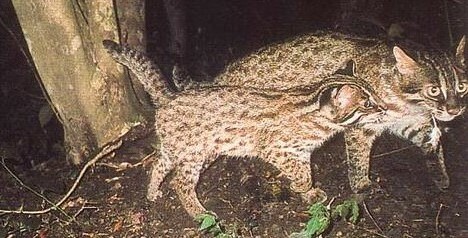 In addition, the guidelines call on the government to construct better roads to reduce the number of traffic accidents -- a major cause of death for the Tsushima leopard cat. They also suggest breeding the wildcats in captivity at several facilities to preserve the species.